Plot: The Espheni attack Cochise (Doug Jones) warned Tom Mason (Noah Wyle) about has come. Never one to miss an opportunity, Tom uses the attack to show off what the Volm can do to convince Lt. Fisher (Luvia Petersen) that they have a real way to stop the invasion. Fisher is impressed and decides to bring Tom to meet the real President of the United States, Benjamin Hathaway (Stephen Collins). Meanwhile, Anne Glass (Moon Bloodgood) decides to find out once and for all what’s wrong with her daughter and Hal Mason (Drew Roy) learns a shocking secret about himself. Ben Mason (Connor Jessup) and Deni (Megan Danso) also have to come to a decision regarding their spikes and what it means to be human. 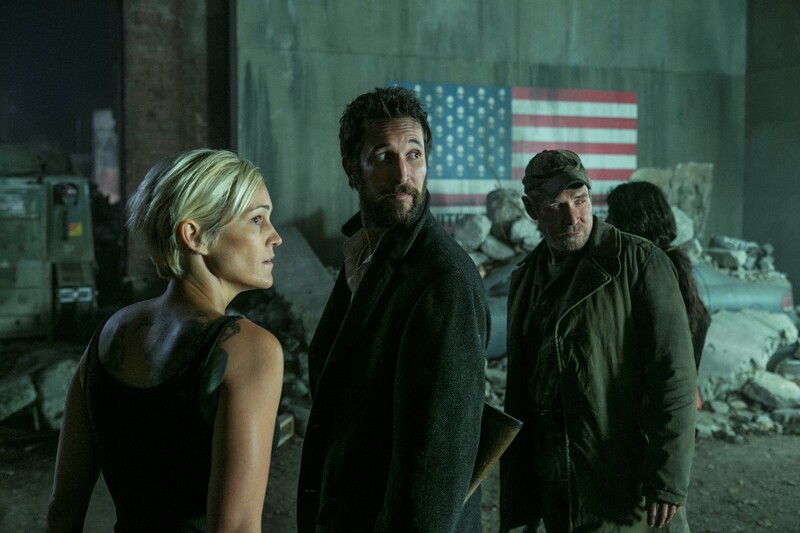 In true Falling Skies fashion, “At All Costs” picked up immediately after the ending scene of “Badlands” with the Espheni attack on Charleston in full swing. Alien ships are flying around, Hal’s on a big gun, commanders are casually walking around a collapsing room talking tersely into phones. This is war people! WAR! Cochise warned Tom about this offensive a few episodes back, so I personally was expecting a full or at least half episode focus about it. Instead, the fighting was over in about a few minutes thanks to some awesome Volm weaponry which lead to an even more satisfying conclusion to the conflict. Not only was Tom able to save his entire community and destroy a massive invading force, he was also able to show off his technological power to the formerly doubtful Fisher. Her amazement towards Tom’s ability to demolish the Espheni was spectacular and a lot of fun to watch. But how were the rest of the episode and the parts that I once thought would be about a big fight? The remaining episode following the fight had some really great moments that both raised and answered questions, but certain conclusions to side-plots simply did not measure up to the rest. What I really loved about this week’s episode was the fact that Cochise took center stage. Finally, some Cochise and Volm coverage that I’ve desperately wanted! Tom taking Cochise to meet the President and the President’s initial apprehension was expected, obviously, but what I didn’t expect was to learn so much about Cochise’s motivations and who he really is. I really welcomed the character development with open arms. Cochise is such a fascinating character and now I’m content knowing even more about him. His story about how he has never seen his home world and his desire for his offspring to have the chance he never had to live there was powerful. It also helped humanize this alien creature, which is always a good thing. Tom meeting President Hathaway was fascinating as well. It was cool watching the President learn about how Tom’s army is the ONLY resistance force actually making a dent in the Espheni forces. This is definitely all thanks to the Volm and I was glad to watch the President slowly walk down the path of alien acceptance that Tom ventured down a long time ago. The cliffhanger ending to this main plot was great too, easily keeping me begging for more. 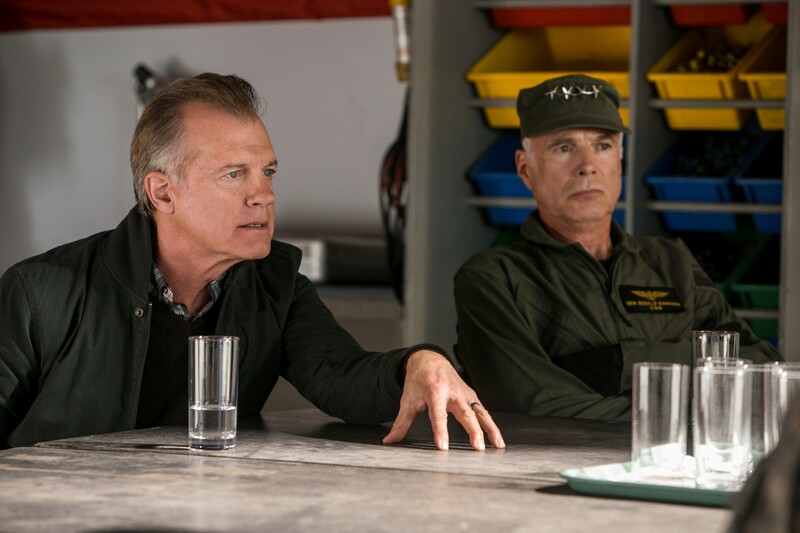 How will Tom and the President reunite after their planes crashed so far apart? Who tipped off the Espheni to the President’s location? How will Cochise survive in a group that already doesn’t trust him? I can’t with to watch these questions get answered in the next episode. This is definitely one of the better cliffhangers the show has had. Hal’s personal turmoil still remains one of the more engaging plots of this season as well. This week saw Hal continue the thought that he might actually be the spy and then discovering that the bug Karen (Jessy Schram) planted has caused him to form another personality. Now we have Hal fighting his own personal Evil Hal for control over his actions. Yes, I am completely aware of how cliché the whole “Evil Personality” premise is, but there was really no other direction this show could have gone considering the events leading up to this. Hal having an Evil side was guaranteed to happen. I’m actually totally okay with this concept and I think this will provide some really excellent moments for the show, if done properly. It’s also very likely that Evil Hal is the one who tipped off the Espheni to where the President was, but this wasn’t completely confirmed this week. For all we know Hal could still not be the real spy. I’m curious as to how Hal will be able to overcome this Evil side, but I’m sure there will be a lot of yelling and punching mirrors involved. Anne’s investigation into who her daughter Alexis really is started off really well but then ended in a series of really stupid decisions. “I want to find out if my daughter is an alien” isn’t exactly something you would say in this type of world, so Anne hiding her daughter’s DNA amongst the DNA of previously harnessed kids was very clever. It also allowed Dr. Roger Kadar (Robert Sean Leonard) to come back which was awesome. The revelation that Alexis has a mix of alien and human DNA wasn’t exactly a shock either since it was pretty obvious something was wrong with her. What I didn’t see coming was Anne totally flipping out, knocking out Kadar with a giant wrench, and then running off with her baby at night. What was she hoping to accomplish with that? I get that she wants to protect her child, but running out into the night is the exact opposite of that. The night is literally dark and full of terrors, so unsurprisingly she is intercepted by a Skitter and a harnessed child. She is also caught by Evil Hal, which was nice added touch. Then we have the other plot with Ben and Deni talking about their spikes and what they’re doing to their bodies. I can’t imagine keeping alien spikes in your body is exactly healthy for you, and this week the formerly harnessed kids learned that the spikes could be killing them. They can get them removed safely, but they also lose any of the perks that come with alien physiology. With Ben, it’s not having Asthma and Deni can see without her glasses. They also have super strength and are basically super soldiers. There was never a moment this episode that I expected Ben to actually go through with giving up his spikes, so his entire process of coming to that conclusion felt like one big circle. Deni actually seemed like she wanted to return to normal and I was pleasantly surprised when it was revealed she wanted to keep them as well. This still doesn’t change the fact that we’re back where we started with these two so whatever apprehension they had during the episode was almost completely pointless. The outcome was predictable and it’s hard to get attached to something when you know it won’t make a difference. “At All Costs” was a notable improvement over “Badlands,” with some amazing characterization for Cochise and Tom meeting the real President as major highlights. 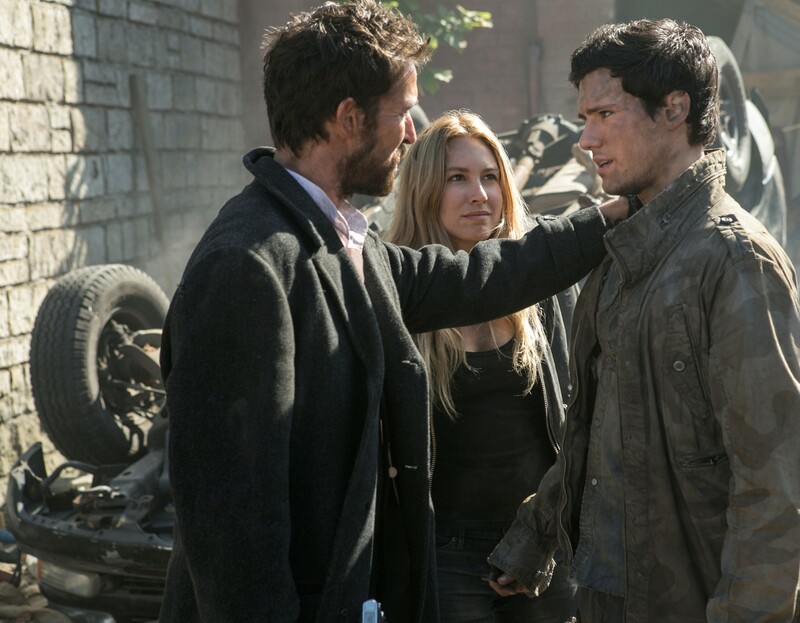 Hal’s growing turmoil and Anne learning for good what is wrong with Alexis was great as well. However, Anne’s subsequent panic and the Ben/Deni circle weighed this episode down. 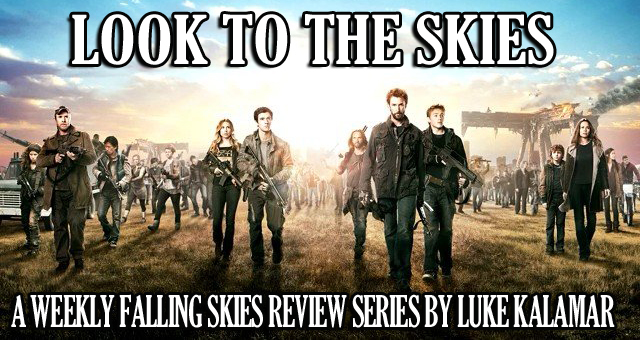 It was still engaging though and leaves an awesome cliffhanger set to be resolved next week.